Ahmad Alkhalaf draws a heart while making a card at day camp for displaced refugee children in Syria. At right, Ahmad dashes away from Rayyan Jalal while playing capture the flag at the camp in December. 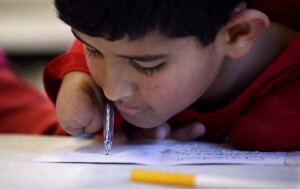 Ahmad, who awaits a more advanced pair of prothetics, attends school in suburban Boston.